The latest developments in Abkhazia–Russia relations turn increasingly sour as Russia attempts to strengthen its presence in the region. As continued Russian funding is dependent on the implementation of the provisions of the Abkhazian–Russian treaty, many Abkhazians grow disenchanted with their key ally. There were heated discussions in Abkhazia this week over the treaty on ‘Alliance and Strategic Partnership’, which was signed between Abkhazia and Russia in November 2014. The treaty was ratified both by the Abkhazian parliament and the Russian State Duma in January. Under its provisions, a joint Abkhaz–Russian Information and Coordination Centre was to be created which was envisioned as a mechanism for sharing information between Russia’s and Abkhazia’s Ministries of Internal Affairs and for establishing a joint command over Russian and Abkhazian military forces patrolling borders and territorial boundaries. On 6 July, up to three hundred members of Abkhazian political parties Amtsakhara (‘a battalion made up of members of one clan’) and Aruaa (‘soldiers’), demonstrated in front of the Abkhazian parliament in the capital, Sokhumi, against the creation of the Information and Coordination Centre. According to the source, the parliament ratified the treaty under heavy Russian pressure without a proper legal understanding of the proposed Centre’s structure and exact competences. The behind-the-scenes rhetoric of Russian officials apparently made Russia’s continuing financial support for Abkhazia conditional on a quick signing of the treaty. Once the treaty was signed, the Russian side demanded the creation of the Centre on its own terms, once again threatening the Abkhazian government with the termination of the funds on which Abkhazia’s economy is almost fully dependent. While the Abkhazian government initially expected that the Centre would be exclusively subordinate to the Abkhazian Ministry of Internal Affairs with some Russian presence, the Russian side has pushed for de-facto control over the institution. 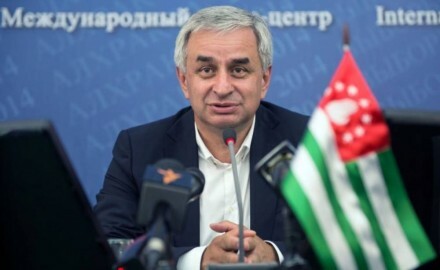 The discussion in the parliament following the protest revealed that the majority of parliamentarians see the Russian conditions as a threat to Abkhazia’s sovereignty, yet they are wary of choosing the prospect of extreme economic hardship over increased Russian dominance. While the overwhelming majority of Abkhazia’s population supports the region’s independence from Georgia, there is a rapidly growing public discontent with Russian policies and a sense of unease regarding the modest thaw between Georgia and Russia. ‘We feel put against the wall. If Georgia recognised Abkhazia’s right to be an independent nation, just like Georgia is, I am fully convinced that 90% of Abkhazia’s population would favour a relationship with Georgia over Russia and [would choose] the European path for Abkhazia’, an inhabitant of Sukhumi told DF Watch. The idea of integration with the European structures is especially popular among the younger generation in Abkhazia who feel deprived of the possibilities of travelling, studying, and working in the European Union countries that their peers from Georgia, Armenia, and Azerbaijan enjoy. One government insider noted that the Abkhazian government is aware that Russia might use Abkhazia as a bargaining chip in its relations with Georgia, using the unresolved status issue to ultimately put both actors under its sphere of influence. Some Abkhazians fear such a development could take place should Georgia abandon its pro-European policy. Many blame Georgia’s policy of non-recognition for being counterproductive as Russia’s dominance over Abkhazia’s politics increases. At the same time, Abkhazia pursues a policy of non-engagement with Georgia before the status issue is solved, focusing instead on gaining recognition from other UN members. As Abkhazian–Georgian relations continue to remain deadlocked, amidst what some call the greatest political challenge in the post-war history of Abkhazia, the feeling among many Abkhazians is that the future is now more uncertain than ever. The article discusses developments as seen from Abkhazia and doesn’t reflect the view of DF Watch. The word ‘Abkhaz’ refers to an ethnicity, while ‘Abkhazian’ refers to an inhabitant of Abkhazia regardless their ethnic background or an institution based in Abkhazia.